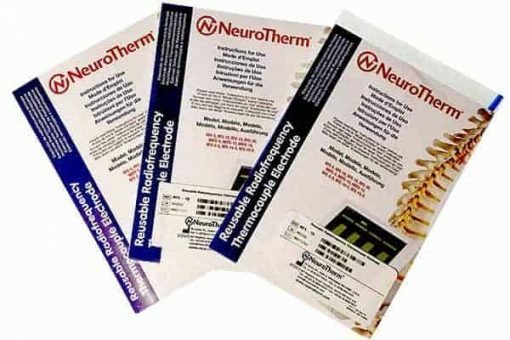 New and used Neurotherm radiofrequency electrodes for sale. RF electrodes are also sometimes called RF probes or radiofrequency probes. We carry all sizes and normally have new, recertified and used electrodes available for sale at up to 50% off. NeuroTherm RF electrodes are engineered for use with radiofrequency generators in RF procedures. 20cm adapter cable. This helps to make sure that both the adapter cable and the radiofrequency generator are well outsideyour sterile field. Neurotherm RF probes (electrodes) are reliable, long-lived and less expensive than many of the other RFA manufacturers electrodes. We sell all brands of electrodes and the Neurotherm probes are a customer favorite.